What it does - You can filter this report by any of the fields available on the incident form and it provides a nice breakdown of each incident. 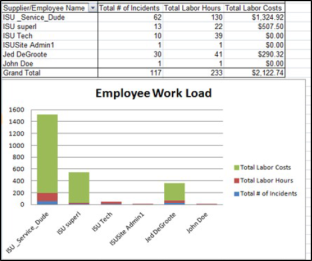 The Incident Summary 2 includes the incident status, the current assigned to, the requester, days aged, labor hours, total costs and more. It can also be grouped by location, problem type, purpose, assigned to, etc. and provide you with a total for each grouping as well as a grand total. Click on Report in the Actions menu, and then click on Incidents. Enter the criteria for your report, making sure to select Summary Report 2 in Step 22. What it does - The Location Summary provides a nice roll-up for each location including the total labor hours and labor costs, material costs, and a total cost by facility. The report also includes some great additional information: the cost per occupant as well as the cost per square foot. Click on Report in the Actions menu, and then click on Locations. What it does - The Problem Type Summary includes the number of hours that have been dedicated to each problem type, the number of work orders per problem type, and the cost for labor and materials. The report also includes some great additional information: the average hours, cost per incident, and the total percentage of work each problem type accounts for. Click on Report in the Actions menu, and then click on Problem Types. Enter the criteria for your report, making sure to select Summary Report in Step 9. Select Problem Type in the drop down box to sort your report result by Problem Type rather than Location. What it does - This report provides a great breakdown of each employee and the total number of hours they've tracked for the given reporting period. The report also includes the average number of hours each employee enters per incident, the average number of days it takes them to complete an incident, as well as the total number of incidents they worked on during the time period identified. What it does - This report not only includes important information about the transactions entered on an incident, but also the incident information itself. For every transaction returned on the report, the report provides the transaction type, transaction description, quantity, costs, etc. as well as the incident description, location, problem type, purpose code, etc. Enter the criteria for your report, making sure to select Detail Report in Step 16. What it does - This Asset Master List provides a complete snapshot of your assets. The report can be generated to include assets for a particular location or group of locations, classification, supplier, etc. The report results return all of the available fields on an asset from the item name, number and description to the operating system, manufacturer, and life expectancy of the unit. Why it's great - The Asset Master List is great for anyone who plans to leverage the asset import tool in Incident. The spreadsheet can be used as a template to populate asset information. The template can then be used to import assets into the asset inventory. Click on Report in the Actions menu, and then click on Asset Inventories. Enter the criteria for your report, making sure to select Master List in Step 13.